Poll: Do we need TV in the main living room? 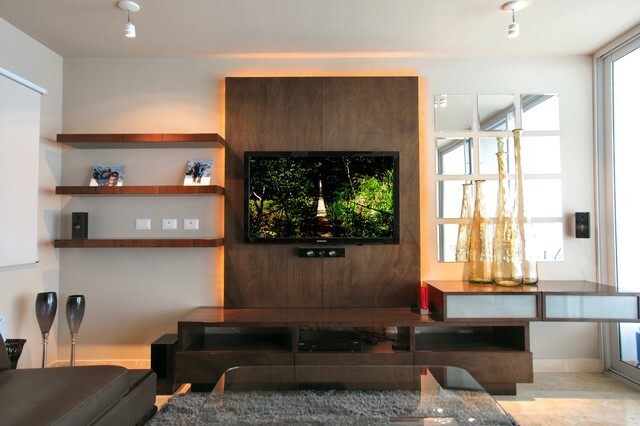 You are here: Home / Building a Beach House / Poll: Do we need TV in the main living room? I’m thinking through our TV plan and I’m needing some advice. The beach house has a large upstairs living room attached to the kitchen and dining area, and a slightly smaller family room on the lower level where the majority of the bedrooms are. We are planning to put a medium sized flat screen TV in every bedroom as well as a large TV in the downstairs family room. Do we need a TV? My preference would be to leave the upstairs main living area TV-free. I am envisioning this as a space to play and visit and just enjoy the people that I’m on vacation with. But my own family doesn’t watch tons of TV, and so I’m wondering if this choice would be a mistake for most families. I personally would like at least one TV-free zone in the home. But if most families would wish for a TV in that room, it might be a better plan to go ahead and get a TV for the space, most likely shutting it into a cupboard to keep it out of sight when it is not used. If you rented this house, would you wish there was a TV in the great room? We leave tv's out of the bedrooms....never had a complaint! Yes to tv. Think about big tv events (college football, sporting events, parades) as well as family movie traditions. We watch Its a Wonderful Life every year at Christmas, and also enjoy other classics like The Wizard of Oz and Taladega Nights 🙂 as an extended family. my thought was why was you putting tvs in the bedrooms? Not only thinking of the expense but the medical field constantly tells us to not do this because it’s not healthy.My kids and grandkids all watch what I consider a lot of tv, but they don’t have them in the bedrooms. Just my thoughts. I want the the 3 master suites especially to have the amenities of a hotel room, and be places where people can retreat and relax when they’re tired of socializing. And one of the sleep/kid lounging spaces will be set up with an Xbox, so that automatically means a TV in that room. So that leaves two other bedrooms in question. In our own family we will have couples or at least grown kids using those last two bedrooms, so to make those rooms feel more equal with the masters, I was thinking it would be nice to do TV”s there too. But you have raised a really good point– when my kids were little , we never had TV’s in kids’ bedrooms, so would not have been a fan of them having TV’s in their beach house bedrooms either. But I know tons of families are used to having TV’s in kids’ bedrooms, so I will have to think about it. One thought on this is that now it is so easy to stream TV or movies on a computer or iPad… especially if you will have WiFi (and maybe a Netflix account for the house to use? but so many people have it now anyway). So, re: relaxing in bedrooms, while having a TV in a bedroom is nice it’s not necessarily the only way a person or couple could watch something. You need a second large gathering space for extended family to spread out and enjoy an adult program versus kids playing video games together… even though we have tv’s in each bedroom we get compliments A LOT that the family members were able to gather in groups comfortably. Go for it! Thanks for that feedback, Nancy! So interesting to hear what guests at your (beautiful) homes have said. I think it probably would be nice to have a tv in both the main rooms. I can think of several instances in other beach houses where some people have been watching a movie together and other people have been playing Xbox , so two big tv’s was nice. As far as tv’s in bedrooms, at this point in our lives we’re going to be sharing a room with little kids, so we’d be more likely to just stream something on a personal device(our laptop or a kindle) that would let us plug in some ear buds and still be watching in our private space without disturbing our kids. We might go for a personal family movie night with an in room tv, but we can do that on a laptop too. At the last house we stayed at the in room tv was either disfunctional or too complicated for us to bother with (I don’t remember). So there is that. As a mom of young children, if I were on vacation, it wouldn’t be very relaxing or enjoyable to have them sequestered in some other room while I’m, for example, in the main space cooking/prepping a meal, socializing with other adults, etc. If I can’t see my children, and they realize that they can’t see me, we’re all in for a heap of troublemaking. 🙂 As a romantic, I also love the idea of a family movie night during a beachfront storm. I was thinking along these lines also! It seems to me that the upstairs family room would be the more likely gathering place, and many would want to have a t.v. there especially families with young children. We don’t watch tons of t.v. at home, but may watch a little more on vacation especially. I like the idea of having the closed door option, so it’s not a distraction if you don’t want it to be. “which is recommended summer reading for fr2e1bnnchers.&#8o2t;What is the list, some kind of home work for the summer?Who sits there and puts this list together?Some kind of Conservative Richard and Judy book list put together on Cameroons sofa?My God how pathetic, the next thing you know there will be a test for you all!